​Early in 1863 a missionary from the Monroe Evangelical Church circuit came to Juda looking for some German-speaking families. Four years and three missionaries later they had gathered a group of eight families who held worship meetings in their homes. On January 31, 1867 this group formally organized and incorporated into a congregation named the Juda Zions Church of the Evangelical Association of North America in the Town of Jefferson, Green County, State of Wisconsin. The congregation first met in the local Methodist Episcopal Church, but soon needed a building of their own. Land was purchased in May of 1867 and a contract let for a 32x50 frame structure with basement and bell tower. ​Rev Finger: We are hereby organized for business. We need to approve a Resolution for Incorporation. Peter Jenny: Be it resolved that this congregation be known officially by the name of Juda Zion’s Church of the Evangelical Association of North America, in the town of Jefferson, Green County, State of Wisconsin. Wm. Asmus: I make a motion that the resolution be adopted. Wm. Haberman: I second the motion. Rev. Finger: Are there any further remarks? Wm. Hartwick: I’d like to voice my hearty approval of the name “Zion”. To me it has the sound of music in it. Rev. Finger: It has the meaning of peace in it. Jerusalem was called Zion. It’s the city of God. It’s the place where God dwells. Any other remarks? Fritz Matzke: The name is well chosen. Rev. Finger: All in favor of this resolution stand on your feet and say “Praise God! Amen!” The name is adopted. ​CORNERSTONES……The dictionary defines a cornerstone as “a stone that forms part of the corner of a building; a foundation stone; the basic, most essential, most important part of a building.” The cornerstones of the first two churches of the Zion congregation have been preserved and can be seen imbedded on the east end of the landscaped bank next to the parking lot. The first church was built during the summer of 1867, just a few months after the Zion congregation was formally organized in January of that year. A meeting had been called for the purpose of building a permanent home for the congregation on May 17, 1867 by the pastor, Rev. Wm. Huelster. Land was purchased for $150, and a 32x50 frame church with a basement and a bell tower was constructed that summer for a cost of $3200. ​Growth of the congregation was steady and the little building soon became inadequate for the increasing membership. On August 22, 1909 the cornerstone was laid for a large red-brick structure and 4 months later the construction was completed. A dedication service was held with the pastor, Rev. A.F. Wendorf, and Bishop Thomas Bowman of Allentown, PA. taking part in the ceremony. Included in the bell tower of the new building was the same bell that had already called the people to worship for the past 42 years. Over the years it became evident that still more room was needed for the growing Sunday School classes and the congregation decided to construct a church that included a new education area. On August 1, 1954 the last service was held in the red-brick structure, the building was razed, and the basement dug for a new lannon-stone church. On Oct. 24, 1954 cornerstone laying ceremonies were held with the pastor, Rev. Wm. King, the District Superintendent, Rev. Wm. C.F. Hayes, and architects Richard Wolfley and Joe Van Meter participating. The current edifice was completed and the first service was held in the sanctuary on June 12, 1955. The cornerstone for Zion Church can be seen on the south-west corner of the current building. In 1867 eight German-speaking families, consisting of the families of Peter Jenny, Wm. Haberman, Wm. Asmus, Fritz Matzke, Wm. Hartwick, Wm. 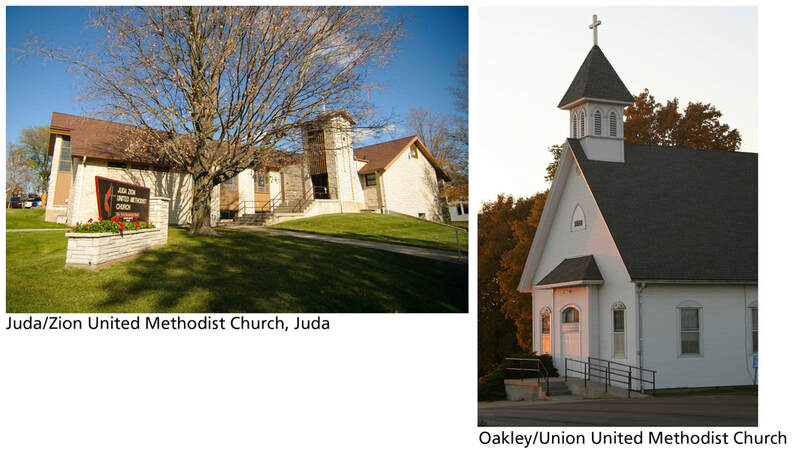 Schwerin, Michael Schwerin, and Gottlieb Hartwick, organized the “Juda Zions Church of the Evangelical Association of North America, in the Town of Jefferson, Green County, State of Wisconsin”. Within a few months the congregation purchased land in the village of Juda and constructed a 32x50 frame building with basement and bell tower at a cost of $3200. As the congregation grew a larger church was needed and in 1909 a red brick structure was built. This served the members until 1954 when it was decided that more Sunday School room was needed for the Youth activities and the present lannon-stone worship center was constructed. Among the items reclaimed from the 1909 church were the large stained glass windows that are a major feature of the current building, and the church bell that has been used in all 3 churches. Over the past 150 years 41 pastors have served the members, 17 candidates for the ministry have been recommended by the congregation, and 3 former members have served in the mission field. Historical items to be displayed during the year will include a copy of the original Incorporation Certificate dated Jan. 31, 1867, a copy of the warranty deed to purchase land for the original church, copies of the 75th, 100th, and 125th anniversary booklets, the original Martin Luther edition of the Bible in the German language, photos of all 41 pastors, and many other items. Wisconsin typical winter weather---1867-1868---snow, cold, ice, etc. What had happened in the last year since the Juda Zion Evangelical Church congregation had officially organized? The little flock first met in homes, and then in the Methodist Episcopal Church (afternoons? every week?) The Zion pastor boarded with the Methodist Episcopal pastor in their parsonage. The congregation grew in spite of the difficulty in getting to services, contending with snow-covered roads and cold temperatures in those horse and buggy days. By the time warmer weather had arrived, the congregation had grown to the point where they realized they needed their own house of worship, and so purchased land just south of the Baptist Church and built a 32x50 frame structure with basement and bell tower. This was the third church built within the village of Juda, the others being the Baptist Church built in 1844 and the Methodist Episcopal Church built in the 1850s. Sunday School classes were so important to the congregation that classes had been held in homes even before they officially organized, and so continued in their own church building, along with worship services. The congregation continued to thrive, adding members monthly, and so in just two years purchased more land and built a parsonage across from the church. This hardy pioneer congregation continued to grow and to become a permanent part of the village. Today, 150 years later, we owe a great debt of gratitude to those early church leaders for their vision of a vibrant, growing congregation in this community.